Enid Neptune, MD, credits much of her success as a physician-scientist to a trait her parents prized: courage. It’s what propelled her on an educational career that took her to some of the most competitive educational institutions in the world: Princeton University, Harvard Medical School, University of California, San Francisco; and Johns Hopkins University. It is as a researcher that Dr. Neptune, now an associate professor of medicine at Johns Hopkins University, perhaps demonstrates best her parents’ wisdom. Dr. Neptune’s research on the role that dysregulation of transforming growth factor (TGF) beta plays in Marfans revealed a pathway that no one had associated with the disease—and not just in the lungs, but in the heart and other organs more often affected by the disease. “The whole sense of Marfan Syndrome shifted, and the types of therapeutic interventions considered promising were altered,” she explains. TGF beta is now the central target protein for Marfans and related disorders such as Loeys-Dietz Syndrome and Familial Thoracic Aortic Aneurysm Disorders. As a member of the National Marfan Foundation’s Professional Advisory Board, she spearheaded the expanding focus on Marfan lung diseases and created the Marfan Sleep Initiative to examine the high prevalence of sleep apnea among patients with the disease. Dr. Neptune’s research has also focused on COPD, a disease that she says is particularly daunting because “it’s not just one disease.” Dr. Neptune forged the idea that single gene disorders can reveal non-intuitive pathways that contribute to such complex lung diseases as COPD. In this way, she has extended her findings in Marfans to COPD. Several years ago, her lab also demonstrated that hepatocyte growth factor could regrow alveoli in mice, opening a potential new therapeutic strategy for a disease that “people really had not thought was treatable,” Dr. Sheppard says. Much of Dr. Neptune’s research has also focused on lung injury early in life, its effects on adult lung function, and whether preventative measures might, for instance, thwart the development of COPD in someone who smoked. 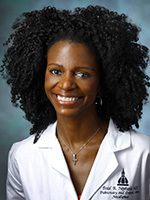 For this work, she has teamed up with Sharon Ann McGrath-Morrow, MD, a pediatric pulmonologist at Hopkins. Dr. Neptune now leads the Translational Research Program in COPD at Hopkins to break down the silos that separate researchers, basic scientists, and clinicians and “generate ideas that can fuel the the next generation of therapeutic interventions sorely needed for this disease,” she says. She also hopes to attract younger pulmonologists, as well as researchers outside respiratory medicine, to a disease whose complexity can be intimidating. Over the years, many patients have touched Dr. Neptune’s heart: people with Marfans, gay men coping with AIDS, and patients suffering from COPD. She seems particularly drawn to patients who battle social stigma along with disease. She finds defending patients socially and culturally deeply humanizing, and, as an African American physician, she feels compelled to point out the inequalities in our health care system, particularly as they affect people of color. Despite a busy professional life, Dr. Neptune says that she also finds delight in family life, modern art, opera, and yoga.